You should know how to set your WiFi name (SSID) and password in your router settings. 4. Click + then choose "Smart wireless mode". If the red indicator on the camera is blinking, tap "Next"
6. Tap "Next". It will take a few seconds for the App to connect the camera to the WiFi via sound wave. You will hear a Ding-dong sound then "Camera ready"
You can connect the camera before mounting it on your ceiling. After re-powering it on within WiFi distance, it will take minutes to re-connect to the WiFi automatically. Why is the image delayed or the camera disconnected? Please make sure the WiFi signal nearby the camera is strong enough & Your WiFi is not a slow network. The monitoring image is transferred in P2P mode, won't be stored on any server. 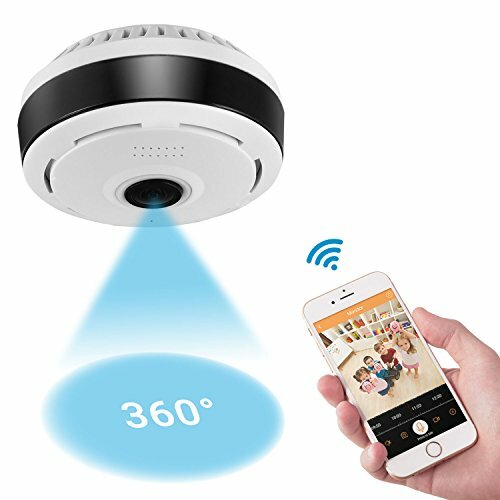 [360 Degree Panoramic Monitoring] Comparing to those ordinary cameras, the biggest advantage of this camera is that it could offers you 360 degree full view monitoring. With the App, you can zoom in and out on the monitoring image, change your viewing angle or even switch view modes to watch the monitoring. The App for the camera requires necessary for specific features such as playback, 2-way-audio, etc. If you have any questions about this product by TimeOwner, contact us by completing and submitting the form below. If you are looking for a specif part number, please include it with your message.